Medical records are important documents that essentially contain a timeline of your health through the years. They contain doctor’s notes, medication lists, past diagnoses, test results, and other pertinent medical information. HIPAA guarantees that everyone has access to their medical records, but that does not mean obtaining them is easy. In fact, it can be a convoluted process, especially if you don’t live near the physician or medical facility that you are requesting records. Thankfully, Order Medical Records is here to help! You might be wondering, “Why would I need copies of my medical records?” at this point, and that is understandable. Medical records are something that you don’t realize you need until it’s too late. There are many reasons you might need copies of your medical records. This includes moving to a new city, state or country because your new physician will request your old records so they can read up on you and make sure they are well informed. This is also the case if you switch doctors for any reason or seek out a specialist. In addition, if you are trying to create a family medical history, the best way to get updated and accurate information is to have everyone hand over their medical records. 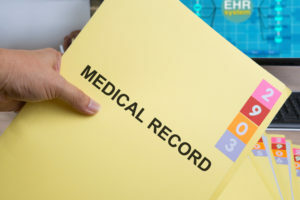 What is Order Medical Records and How Can We Help? Order Medical Records is a company that specializes in medical record retrieval. That means that we serve as the intermediary between you and the medical facility that is housing your documents. That can be the doctor’s office around the corner, a hospital across the state, your old physician across the country, or even a medical facility overseas in another country. Trying to locate medical records on your own is often no easy feat and can be quite time consuming and frustrating. Thankfully, at Order Medical Records, we make the process of ordering medical records fast, convenient, and affordable. In fact, our process is so convenient, that you can complete it in as little as five minutes. If that’s not enough, you can also complete it all online from the comfort of your own home. That’s right! You can order your medical records in minutes, right from the couch while wearing pajamas. Visit Order Medical Records On the Web Today to Start the Ordering Process! If you are in need of copies of your medical records, contact Order Medical Records today! Simply visit us online at Order Medical Records to start the ordering process. You simply need to enter your contact information and the information of the medical facility housing your records and we will take care of the rest. We will even deliver your copies in the manner you request—via the mail or digitally. If you need medical records, don’t wait! Start the process today with the help of Order Medical Records.